MakaiLay Power is specifically designed for the submarine power cable industry and provides tools to manage and install power cables on the seafloor with a high degree of accuracy and precision. Pictures showing cable suspensions along the bottom. These cables were designed for 30 years, but failed just after 5 years of operation. Power cables are considerably heavier and more stiff than fiber optic cables. While fiber optic cables are installed with a small amount of slack on the seabed, power cables have to be installed with some residual tension on the seabed. This is done in order to avoid cable bend radii smaller than those recommended by the manufacturer and prevent cable damage at the touchdown. Due to the fact that conventional installers of power cables do not have the means to accurately estimate the cable tension on the seabed, they operate with very high safety factors. Consequently, power cables are usually installed with tensions that are much higher than the required values. Cable suspensions occur more often than desired as a result. As shown in the figure to the left, at these seafloor contact points, large reaction forces and small bend radii are common, thereby reducing the life expectancy of the cable due to increased wearing and chafing. In order to maximize the life expectancy of the cable, the power cable installer must accurately lay the cable with low values of bottom tension to avoid cable suspensions, but at the same time it must maintain a small amount of tension at the touchdown to prevent cable damage. 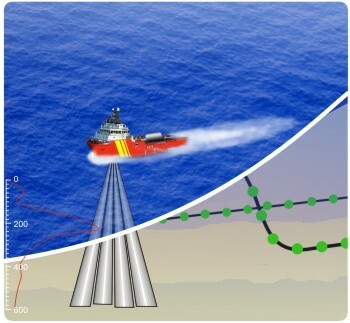 The bottom tension and cable touchdown location can be accurately managed using MakaiLay Power, which has the capability to accurately model the 3D cable shape, touchdown location, and tension on the seabed in real-time. The top illustration shows the traditional installation method that results in high bottom tension and cable suspensions which lead to a reduced lifespan of the cable. The bottom illustration shows what can be accomplished by using MakaiLay Power to model the touchdown cable conditions and control bottom tension thereby avoiding cable suspensions. Traditional installation methods often result in large cable suspensions which reduce the lifespan of the cable. The key to minimizing suspensions is to accurately control the cable tensions at touchdown. However, due to the lack of measurement capabilities, tension at touchdown is calculated from measured top conditions of the cable. where Ttop is the top cable tension (measured at the vessel), Tbot is the cable tension at the touchdown, W is the cable wet weight per unit length and H is the water depth at the touchdown (see figure to the right). This simple relationship is useful for calculating cable bottom tension only when installing the cable in relatively shallow waters and on a flat seabed. 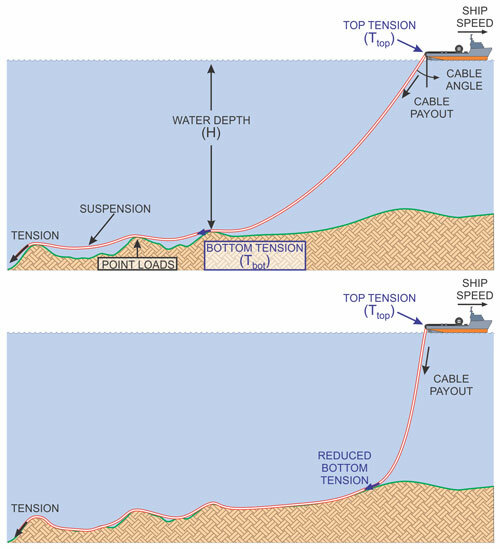 In mid- and deep waters, the weight of the suspended cable in the water column (WxH) tends to be considerably larger than the desired value of bottom tension, and in most cases the noise in the measurements of top tension (due to cable and ship dynamics) is equal to or larger than the low values of Tbot the installer wants to maintain. Therefore, simply measuring Ttop does not provide a good method to estimate the values of bottom tension. 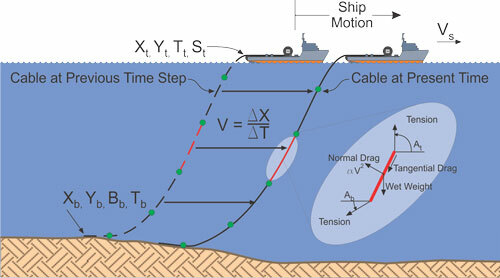 In addition, not having an accurate model of the cable dynamics in the water column can introduce large errors in the exact location of the cable touchdown, so while laying up-slopes or down-slopes, these errors can quickly affect the true touchdown depth, H, and consequently the estimated values of Tbot. A typical example is when laying cable down the slope. If the operator wants to decrease the value of bottom tension, the logical step is to pay out more cable at the surface. However, in this case the cable touchdown becomes deeper and the Ttop increases. As the tension increases, the operator thinks he should pay out more cable to decrease the tension, but this only makes the situation worse. Another common practice of estimating bottom tension is by using the cable angle at the sheave. In shallow waters, the cable angle is more sensitive to the changes in cable bottom tension so this method works. However, in deep waters, the cable enters the water almost vertically and is very insensitive to changes in cable bottom tension, therefore, the value of cable angle does not provide accurate feedback on cable tension. A cable control system can accurately model the cable touchdown and bottom tension, both of which are essential to properly install power cables. MakaiLay Power takes into account cable characteristics, ship velocity, cable payout, bathymetry, currents and other parameters and calculates accurate touchdown positions and tensions. MakaiLay Power can guide the ship along the Ship Plan by working directly with a DP system or by displaying guidance to the helmsman. The navigation display provides ship The heart of MakaiLay Power is a detailed and rigorous 3-D dynamic model of the cable which has been validated in many military and commercial operations over the last two decades. The model accurately computes the geometry and forces acting on the suspended cable, the cable touchdown position, and bottom tension. This is accomplished by taking into account cable characteristics (size/weight), ship velocity, cable payout rate, bathymetry, currents and all other parameters affecting the dynamic position and accuracy of the cable lay. With such knowledge available at all times, immediate and accurate cable lay forecasts and command decisions can be made that account for any complex real-world situation, both planned and unplanned. Simulation software for ocean bottom cables (OBC) installations. MakaiLay Power changes the focus of cable deployment control from the cable condition as it leaves the vessel (current practice) to its condition on the seafloor. It allows cable installers to focus on the most important issue in any cable lay: the installed condition of the cable on the seafloor. The sophisticated computer model monitors in near real-time the cable bottom conditions (location and tension) in the recent past and can predict the results of future cable payout and ship actions on cable seafloor conditions. Outputs are presented to the user in tabular and graphical form. 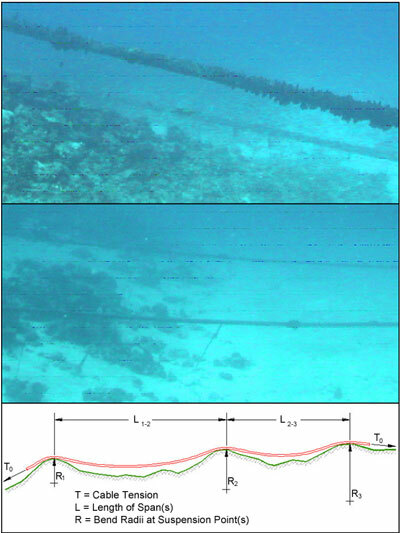 The result is a major improvement in the installer’s knowledge of the cable condition on the seafloor and in his ability to predict and control touchdown conditions, eliminating the major uncertainties inherent in current installation techniques. 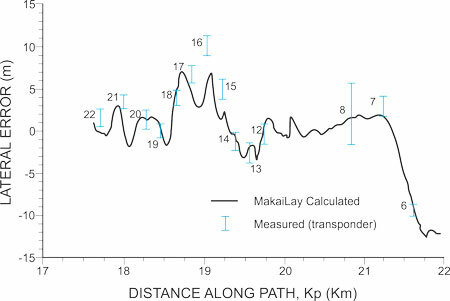 In addition to monitoring the cable installation by providing real-time feedback of the cable shape and touchdown conditions (i.e., location and tension) during the lay, MakaiLay Power has the capability to predict future cable touchdown conditions for a given set of ship and cable instructions. Having such a prediction is like a having a crystal ball – multiple "what-if" scenarios can be run manually by the user or he can let the software automatically compute the best set of cable payout rate instructions in order to maintain the desired values of cable bottom tension along the route and prevent undesirable touchdown conditions. With real-time control and the full power of the MakaiLay model at sea, the correct adjustments to the initial plan can be easily and reliably made before they become problems. Cable operations can be monitored and reasonably controlled under nearly any real-time condition. Performing analysis of a cable installation after it has been completed. 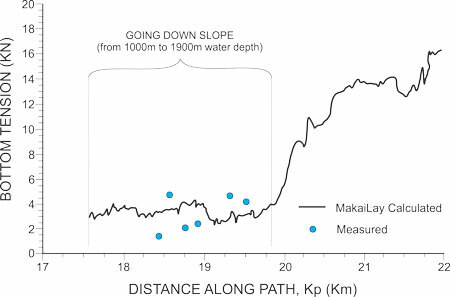 In simulation mode, MakaiLay behaves exactly as it does at sea. Detailed three-dimensional cable solutions are available to the operator. MakaiLay Power can simulate cable installations much faster than real time. Depending upon the speed of the computer being used, cable lays can be completed at 40 – 50 times faster than real-time. A 30-day cable lay can therefore be completed in the office in less than one day of simulation. MakaiLay Power can be used to simulate a submarine power cable installation in the office prior to the at-sea operation to analyze seafloor conditions and create a ship plan for navigation. Once the cable has been installed at-sea using MakaiPlan Power, the as-laid logs can be used to analyze the installation operation. MakaiLay Power control station onboard an installation vessel. MakaiLay Power can guide the ship along the Ship Plan by working directly with a Dynamic Positioning system or by displaying guidance to the helmsman. The navigation display provides ship guidance information and optionally shows any or all other related information in a GIS environment. MakaiLay Power uses real-time currents measured using an ADCP to improve placement accuracy and control tension of the cable at touchdown. The software can log ocean currents measured in real-time using an Acoustic Current Doppler Profiler (ADCP). The current data that is logged is filtered and used by the 3D cable model in real-time to provide the user with more accurate cable shape and touchdown conditions during the installation and retrieval operations. Depending on the type of cable being installed, making use of real-time current measurements can improve the cable placement accuracy and tension control by a factor of 2 to 4. Even in relatively shallow water (<80m), strong currents can have a significant effect on cable placement and tension/slack control. The MakaiLay Power 3D cable model is also capable of accurately modeling the retrieval of cables. New tools were added to MakaiLay Power to allow users to rUsing Makai’s Retrieval Method, cables can be recovered with lower seabed tensions minimizing dragging on the seafloor.ecover any previously laid cable whose as-laid configuration was determined by another cable installation system, survey data, or any other method. With recent improvements, the software can now model more accurately the cable-seabed interactions and cable being dragged as a result of the seabed cable tension. Having an accurate knowledge of the cable conditions on the seabed at all times allows for cable retrieval with lower seabed tensions, which in turn decreases cable dragging on the seabed. This helps minimize cable fouling with bottom outcrops and cable abrasion, thus providing longer cable life. MakaiLay Power logs all data critical to the cable installation and can log any other available digital data as well. The software provides extensive documentation on the cable lay both in detailed data logs and in GIS as-laid databases. Data retrieval, display and compatibility with other software are very flexible. 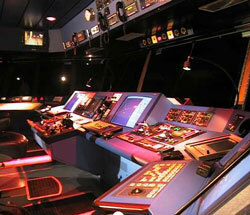 As-laid user-configured charts, tables, 3-D images and summaries can be retrieved at any time during the lay on either the main computer or on remote stations throughout the ship. Alenuihaha cable route for three power cables between Maui and Hawaii. Makai Ocean Engineering has strived for excellence in understanding, analyzing, and performing submarine cable installations. We have been working on submarine cable projects since 1983 and formally created our cable division in 1988. Since that time, we have been involved in a variety of difficult cable installations, each of which has challenged, expanded and tested our capabilities. Below is one of the case studies to illustrate the capabilities of the software in accurate placement and tension control of a power cable. Many more installations completed by the military and the commercial industry have been used to validate the MakaiLay software using different cable types and laying conditions. The Hawaii Deep Water Cable Program was a research and development program co-sponsored by the U.S. Department of Energy and the State of Hawaii in the late 80’s. The purpose of this program was to determine the technical feasibility of deploying and operating a submarine power transmission cable between the Island of Hawaii and the Island of Maui. Because of the difficult bottom conditions, the acceptable cable path was quite narrow. The cable had to be laid to an accuracy of 12 meters. Furthermore, the cable had to be laid at a very slight positive tension, no slack. Makai coordinated and directed the route survey across the Alenuihaha Channel. We quickly determined that conventional cable laying techniques were not suitable due to the difficulty of the cable route and the accuracy required (12 meters). It was necessary to have a better analytical understanding of the cable laying process. Makai developed a detailed analytical and numerical model that was sufficiently fast and accurate to simulate, analyze and control the cable installation in real-time. In 1989, a test cable was laid along the Alenuihaha channel cable route. The cable was laid and recovered three times. This program was a precise test of the ability to lay cable. A long-base acoustic navigation grid was established on the seabed and transponders were attached every 300 meters along the cable to track its progress while laying. As-installed cable positions were acoustically measured within one meter RMS. A manned submersible was used to inspect the cable on the seabed and to measure as-laid cable tension. 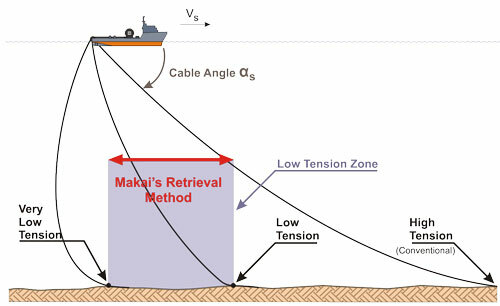 Makai’s Integrated Control System (a predecessor of the new MakaiLay Power) guided the cable ship and directed the cable payout. Cable solutions were computed in real time each minute and instructions issued every five minutes. Current profiles were measured with an ADCP and incorporated into the solution. The final result was that the RMS error for all portions of the 20 km of cable laid was 4.7 meters, considerably less than the 12 m goal. Bottom cable tension tolerances were equally well met. This program demonstrated that cable lays could be carefully controlled with the use of the proper tools incorporated into the control system. This program also validated the cable model used in those controls. 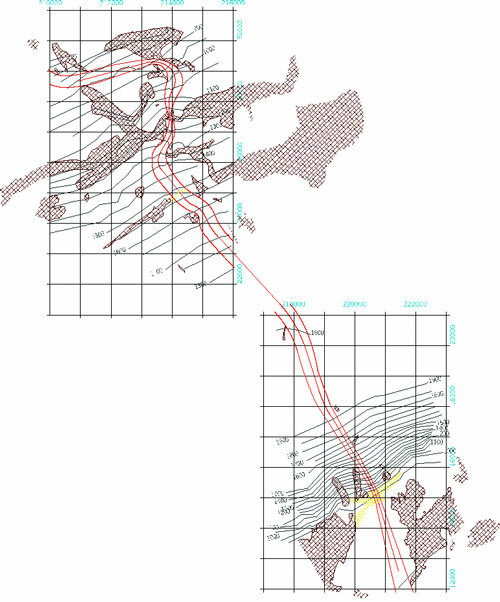 Difference between calculated vs. measured (99% confidence) cable positions along the route. Calculated vs. measured cable bottom tension along the route (value of bottom tensions were less than 8% of the cable tension on the surface).